One of the defining moments of Eric Bledsoe’s short career with the Bucks so far happened in the first round of last year’s playoffs when he allowed Celtics guard Terry Rozier to punk him in Games 1 and 2 of the series, pretended to not know who Rozier was, and then allowed himself to get punked again. Since then the Milwaukee guard has worked hard this season to not just put that sour memory behind him, but also improve his composure enough to help push his team to the top seed in the conference. Unfortunately, he took a few steps backward on his progress against the Philadelphia 76ers on Thursday night, lashing out against a good player on a conference contender. Less than three minutes into the game, Giannis Antetokounmpo shot an unguarded three from the top of the arc and hit nothing but net. 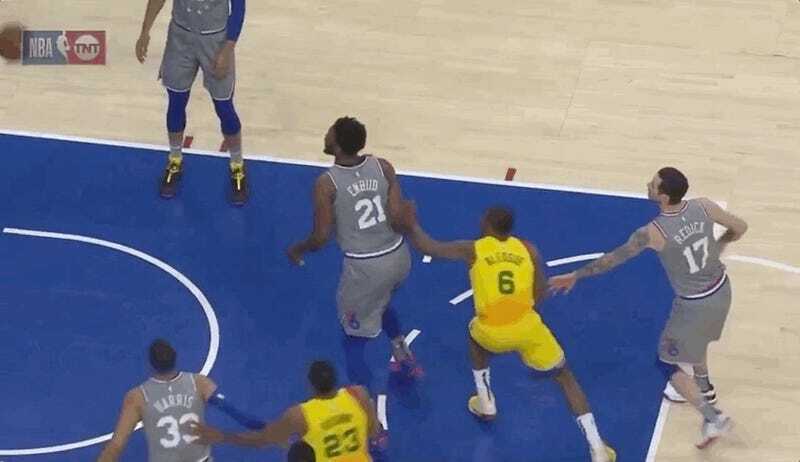 As the ball was in the air, however, Joel Embiid gave Bledsoe a little shove in an attempt to secure the potential rebound. When the shot went in, Bledsoe gave a retaliatory shove and got called for a foul. Embiid lightly passed the ball to the Bucks guard as a slight taunt for what he did, and Bledsoe responded with his best Danny Ainge impression, with the ball hitting the big man’s chest instead of his head. Bledsoe was ejected, and Joel Embiid was given a tech. Now all that’s left to wait for is Bledsoe’s postgame comments where he’ll pretend to not know who Embiid is and then get dunked on in the playoffs as the Sixers big man drops 60 on the Bucks. Maybe Eric Bledsoe should chill out.